When did sports become all about winning and not about having fun? 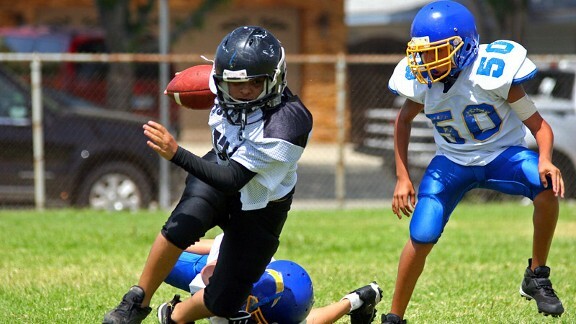 Thinkstock.com A pee wee football player evades a defender. Did we forget how to have fun in sports? What you’re about to read is an email a very intense football coach recently sent to his players. Can you guess the level he coaches? A few hints first: This league sings the national anthem before every game. And it has cheerleaders. And training camps. And a draft, a combine, and two-hour practices. But it’s not the NFL. Big-time high school football, at the very least? Wrong. This email was sent to 8-year-olds. Of the 19 families who got the email, seven quit the team, including that one. Apparently, they realized they were in the wrong place. The coach who sent it, Camron Miller, is an admittedly “overweight” 36-year-old geologist in Frisco, Texas, 30 minutes north of Dallas, where people take their football the way bishops take their Bible. “I don’t regret sending it,” says Miller, who insists only two of the seven families who quit did it because of his gung-holier-than-thou fervor. “Intensity is not a bad thing. Some of the best coaches — and teachers — I’ve ever had, were intense. … That email was needed. Needed? These kids are third-graders! Eight-year-olds don’t need to go to a summer football training camp in the Texas heat. They don’t need three two-hour practices a week. They don’t need to be drilled like they’re the Dallas Cowboys. Whatever happened to learning to love the game first? Yes, by God, let’s ramp it up. They can dig for worms later. People, what’s become of us? Does anybody remember when THEY were 8 years old? Your basic 8-year-old doesn’t need ramping up. Your basic 8-year-old just needs his buddies, a cool helmet, and a Dairy Queen Blizzard afterward, win or lose. Instead, we get coaches like Miller, wanna-be Bill Belichicks who watch too much NFL Network and try to recreate their lost high school glories through kids who just want to go home and recreate their favorite Lego spaceships. When I coached kids in baseball, I started every season with the same speech, “Boys, we are not here to win baseball games. We are not here to learn sportsmanship. We are here to learn how to chew sunflower seeds without using our hands.” And we’d stand in a circle until every kid could show me a naked seed on his tongue. Full speed ahead. We are amped up to ramp up in this country. We have ramped up the intensity in football from Pee Wees to pros. We have freshman high school quarterbacks who are considered “behind” if they don’t have their own offseason skills coach. We had no less than six high school players die of heat exhaustion last season during summer training drills. We have NFL assistant coaches such as Gregg Williams of the New Orleans Saints ranting at his players to injure people in a playoff game. Is it any wonder where Camron Miller gets these ideas? To its credit, the Frisco league sent Miller an email telling him to back off the intensity knob a little. That caused Miller to do some “serious soul-searching.” The search turned up empty. And what of the son of our anonymous parent? “He’s going to spend the fall just being a kid,” says the parent. Uh-oh. Sounds like somebody doesn’t have the killer instinct.